Today is Holocaust Memorial Day and I think that it is important that we remember the events of the Holocaust. I've not visited any of the concentration camps, but I know that for people who have it is a very moving experience. I have visited the old main Synagogue in Berlin, the Neue Synagoge, and it is appalling to think that that beautiful building was once the centre of a thriving community, a community that was decimated by the evil acts of the Nazis. We should remember the victims of the Holocaust and resolve never to let anything like it happen again and do all we can to combat prejudice. I think that the proposals by the Scottish Government to allow primary school children subsidised visits to some museums is a good idea. The scheme would allow pupils to visit Culloden, Bannockburn and the new Robert Burns Birthplace Museum, as well as Historic Scotland sites and the excellent New Lanark World Heritage site. I just wonder if this covers all of the rich variety of Scotland's history. For a pupil in Dundee to understand the history of our city a visit to wonderful Verdant Works or Discovery may be more appropriate. I have raised this matter with the City Council's Education Department and I will raise it with the Scottish Government. I share the concerns of my friend and colleague Kevin Keenan regarding graffiti in Downfield. There can be no excuse for this and it should not be tolerated. 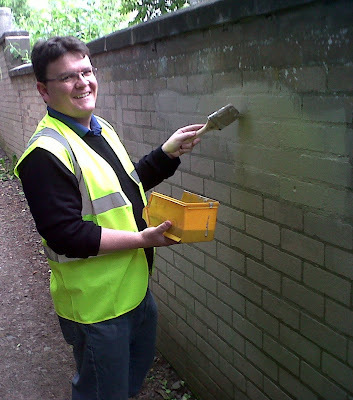 I have been campaigning against graffiti in the West End and right across Dundee. I have been pleased to join with local people in the West End dealing with the scourge of graffiti and the photograph here shows me painting out graffiti last summer. I hope that the culprits are caught and dealt with appropriately. If you have concerns about graffiti in your area please get in touch with me. Monday evening saw a marathon meeting of the City Council's Policy and Resources Committee which focused mostly on the proposals for a Biomass plant on the waterfront, the extensive report presented to us can be found here. The City Chambers were packed with members of the public who were interested in this decision. Like many other councillors I was surprised that this was not debated at the council's Development Management Committee which is quasi-judicial in nature and non-political. It is passing strange that we were told to treat it as if it was quasi-judicial but then when it came to the crunch it was made clear to us that this was not actually the case. I am still left pondering why this was the case. A number of delegations were heard mostly against but there was also one in favour. All delegations spoke eloquently and made their points well. On the whole I thought that the case for the biomass plant had not been made, however I was also clear that Monday's committee was not an entirely appropriate forum for trying to answer the questions and concerns raised on both sides. This made it clear to me that a public inquiry was probably the best outcome for everyone concerned. When it came to motions being put forward it is interesting to note that there was scope for agreement amongst the Labour, Liberal Democrat, and Conservative groups and the elected independent member. It was disappointing that the Administration put forward a motion which, in effect, kicked the decision into the long-grass. I would also point out to the Lord Provost who said that he would vote in support of the Administration's proposals but that he was concerned not to have seen an indication of what the plant might look like that there is a picture on page 52 of the report which does show what it might look like. I voted to object to the proposal. The basis of my vote was that I have great concerns about the emissions that might come from this plant and the impact that this might have on the health of the people of Dundee. This was my prime concern on this issue. I do also have concerns about the physical impact on the waterfront of this plant and do wonder how appropriate it is to be campaigning to bring the iconic V & A to Dundee and at the same time possibly allowing a large energy plant not too far away from the V & A. The cross-party motion was defeated by the Administration's motion which means that the council is looking for further detail. I remain convinced that a public inquiry would be the best outcome now. I will always take issues on the environment very seriously. I am a member of the Labour Party's environmental campaigning organisation SERA and believe that taking an interest in the environment is important. Monday evening saw a very long meeting of the council's committees, this was due to a long debate about the biomass proposals which I'll cover elsewhere. The Education Committee agreed to refurbish the roof at Blackness Primary School. I was pleased to see this investment in this popular West End school. My colleague Laurie Bidwell attempted to raise a debate on the educational impact of proposed cuts in the education budget. Debate on this important matter in the Education Committee with the church representatives and teacher representatives present was stifled by the Administration. It is a shame that debate was stifled we should be listening to the views of the teacher representatives on the committee as well as the church representatives. At the City Development Committee I welcomed the proposals that the council demonstrate its concern about the future of RAF Leuchars. I've made clear that any changes to Leuchars would have an adverse effect on the Dundee economy. At the Housing Committee the SNP Administration pushed through a 4.5% rise in council house rents. They hid behind procedural rules rather than explain their position to the committee which was very unfortunate. On Monday along with a number of other council colleagues I was pleased to visit the Dundee Carers Centre. It was a good opportunity to hear about the work of the centre and to visit their new premises in Argyll House. 1in 8 of the population are carers. Thee are almost 660,000 carers in Scotland; over 115,000 care for over 50 hours a week. There are over 100,000 young carers aged 3-18 years in Scotland; 21% spend 30-39 hours per week caring. There are more carers than the total health and social care workforce. Replacing the care provided by unpaid carers would cost three quarters of the total NHS budget in Scotland - £7.68 billion each year. I think that we need to work to help support carers who make such a difference in our society. I would want to place on record my appreciation of all the work done by carers. I will certainly be reading the Carers Manifesto for the 2011 elections. I recognise that carers play an invaluable role in supporting those they care for to live in their own homes and to participate in the local community. This contribution should be recognised by fair rules and support. Labour plans to do this after the elections in May.